The Future of Learning (FoL) project aimed to advance the state of the art by developing a range of new and imaginative visions on initial and lifelong learning in Europe by 2025. The foresight project elaborates on six major challenges for future learning. These include multicultural integration, early school leaving, talent development, improving the transition from school to work, re-skilling and re-entry into the labour market. These challenges were elaborated as scenarios and illustrated through six different personas. Europe will be confronted with new challenges arising from the changes in the labour market in the coming decade. Ageing, globalisation, migration and technology will be key drivers of change. By 2020, 16 million more jobs in the EU will require high qualifications while the number of low-skilled jobs will decline by about 12 million. The ageing of European societies means that large numbers of workers will start to retire in the coming years. Labour shortages are expected in many sectors. Dealing with these anticipated shortages and enhancing Europe’s global competitiveness while improving productivity and innovation will require a massive investment in the advancement of skills and competences of Europe’s workforce. Many jobs will be profoundly affected by global developments and policy decisions. Key global developments include outsourcing and offshoring, which change the number, content and nature of job functions. The broad trends towards sustainable development across Europe and the world will significantly change – in the face of future energy shortages and the fight to reduce greenhouse gas emissions – the types of products produced and services rendered as well as the way in which they are produced. All these developments are taking place in the context of a (financial) crisis that has swept the world since mid-2008 and which is unprecedented in both its size and its effects on production and trade. Depending on the nature and duration of the crisis, the effects on employment will be profound, especially in the manufacturing sectors but with possible knock-on effects on jobs in the public sector as well. New technologies (information and communication technologies (ICT), biotech, manufacturing) will play a major role in shaping future labour markets. They also pose major challenges for Europe’s education and training systems. ICT will need to play a role in providing education more efficiently as teachers will start to retire in large numbers in the near future. ICT will also allow education and training to become much more effective by enabling new teaching and learning methods and changing the roles of teachers and learners. Public policies at national and EU levels will be of key importance to support the transition of the labour market towards a very different situation by the year 2025. The Foresight on Learning, Innovation and Creativity (FORLIC) project aims to advance the state of the art in learning foresight by developing a range of new and imaginative visions on the key components of creative and innovative learning in Europe by 2020. The foresight project focuses on emergent skills and competences, related changes in roles of teachers and learners in the learning process, implications for the education and training system, the role of ICT as an enabler of change, certification and accreditation, and policy implications. Desk research: reviewing relevant foresight studies on learning, ICT, skills and competences, and innovation and creativity. Vision building: organizing a series of online expert and stakeholder consultations and workshops for development of visions on the future of learning. Scenario development: elaborating and assessing a range of scenarios illustrating key challenges identified in the visions in a variety of audio-visual and multimedia formats. Developing policy recommendations: identifying strategic issues for policymakers on new ways to learn new skills for future jobs. Dissemination: disseminating visions and scenarios on relevant online platforms; integrating results of all contributions in a final report synthesising visions, scenarios and key strategic issues. The review of relevant foresights used a range of different materials including information from the European Foresight Monitoring project (EFMN) and the European Foresight Platform (EFP). A number of different methods were used in vision building. One was a group concept mapping study undertaken by the Open University (Stoyanov et al., 2010). This method generates, clusters and rates different aspects of possible educational, technological, economic and scientific futures. The results were used to develop a range of scenarios for initial and for lifelong learning. 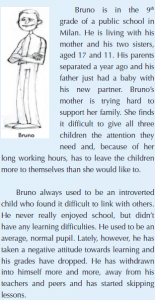 These scenarios were elaborated as personas illustrating a learning issue or challenge. Initially nine personas were developed (Figure 1). The personas were used to discuss a range of issues on the future of learning through a series of online expert and stakeholder consultations. These consultations were held through the Future of Learning LinkedIn group. The group had been set up for the purpose and counted over 1100 members. The consultations involved a series of qualitative online discussions and quantitative surveys that served as inputs for elaborating the challenges and personas. Further inputs were obtained through an expert workshop. A set of policy recommendations suited to tackle the challenges was developed. Finally, six of the nine personas representing key challenges were elaborated into animated video clips, available on YouTube and on the project website. The overall vision based on the group concept mapping, the online stakeholder and expert consultations, and the workshops is that personalisation, collaboration and informalisation (informal learning) will be key trends at the core of learning in the future. These terms are not new in education and training, but they will become the central guiding principle for organising learning and teaching in the future. The central learning paradigm is thus characterised by lifelong and life-wide learning and shaped by the ubiquity of ICT. At the same time, due to fast advances in technology and structural changes in European labour markets related to demographic change, globalisation and immigration, generic and transversal skills are becoming more important. These skills should help citizens to become lifelong learners who flexibly respond to change, are able to pro-actively develop their competences and thrive in collaborative learning and working environments. New skills. The increased pace of change will bring new skills and competences to the fore, in particular generic, transversal and cross-cutting skills, which will enable citizens to flexibly and proactively respond to change and to seize and benefit from lifelong learning opportunities. Problem-solving, reflection, creativity, critical thinking, learning to learn, risk-taking, collaboration and entrepreneurship will become key competences for a successful life in the European society of the future. While mathematical, verbal, scientific and digital literacy will remain key building blocks for successful participation in society, it will become increasingly important for citizens to have a better understanding and awareness of the natural and social environment in which they live. This will lead to a new focus on nature and health, on the one hand, and on civic competences, on the other. New learning patterns. With the emergence of lifelong and life-wide learning as the central learning paradigm for the future, learning strategies and pedagogical approaches will undergo drastic changes. With the evolution of ICT, personalised learning and individual mentoring will become a reality. Teachers/trainers will need to be trained to exploit the available resources and tools to support tailor-made learning pathways and experiences that are motivating and engaging while being efficient, relevant and challenging at the same time. 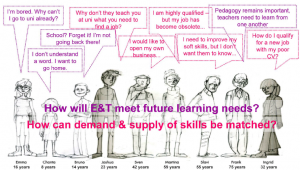 Along with changing pedagogies, assessment strategies and curricula will need to change, and, most importantly, traditional education and training institutions – schools and universities, vocational and adult training providers – will need to reposition themselves in the emerging learning landscape. They will need to experiment with new formats and strategies for learning and teaching to be able to offer relevant, effective and high quality learning experiences in the future. In particular, they will need to respond more flexibly to individual learners’ needs and changing labour market requirements. Initial education will have to address challenges of inclusion of an increasingly diverse population, to ensure participation by all, address the problem of early school leaving, and to foster a wide range of different talents. Lifelong education and training will need to address issues of matching qualifications to labour market requirements, of labour market reintegration to improve labour market participation, and of re-skilling in the face of rapidly changing job content and new technologies. These challenges are elaborated in six key personas (Figure 3).